Here at Annie’s , we love our giant Papavers and we grow over 30 different varieties. 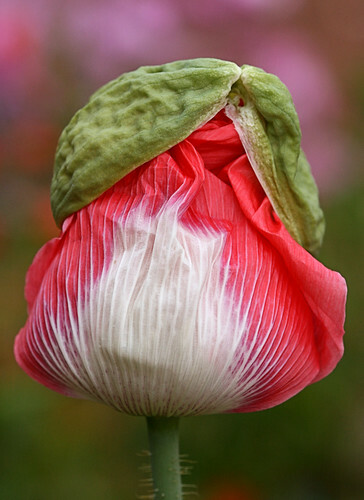 Call us crazy, but we have a theory that there’s a Papaver for every personality and every garden! 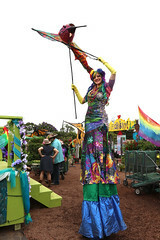 Crazy colorful and wild at heart, Papaver ‘Drama Queen’ isn’t afraid to say: “Don’t mess with me fellas! This isn’t my first time at the rodeo!” Beautiful, brazen and so far over-the-top, the garden falls into silence the minute one of its buds pops open. All of its Poppy friends hide their wire hangers when it comes over. 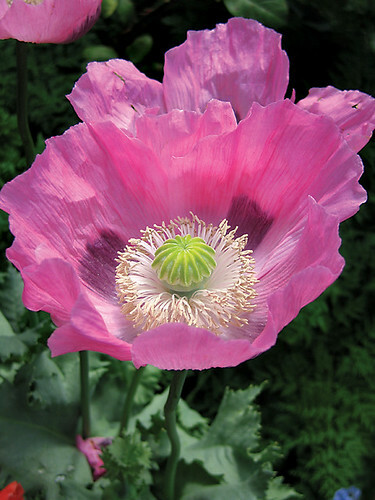 So sweet and sunny and perfectly princess pink, pretty Papaver ‘Cupcake’ always sees the compost pile as half full. So dang upbeat, it’s infectious – it can even make people who hate pink spontaneously burst out into song. Like a gift from the Poppy gods, ‘Venus’ is a cross between a neo-classical goddess and a cheerleader on steroids. When it lifts its massive salmon-pink pom-poms skyward and shouts: “Give me a P!” the crowd goes wild. 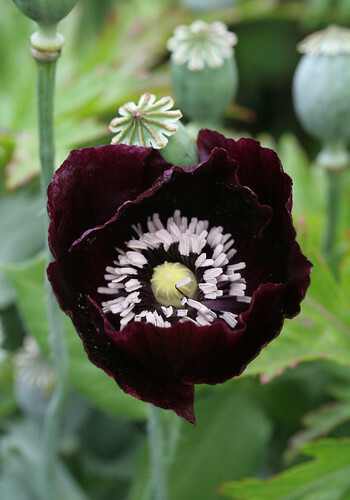 Like Stevie Nicks in her witchy phase, Papaver ‘Single Black’ swirls around the garden in a cloak of deepest maroony-black petals. People rely on it to add a touch of danger and intrigue wherever it’s planted and it never disappoints. 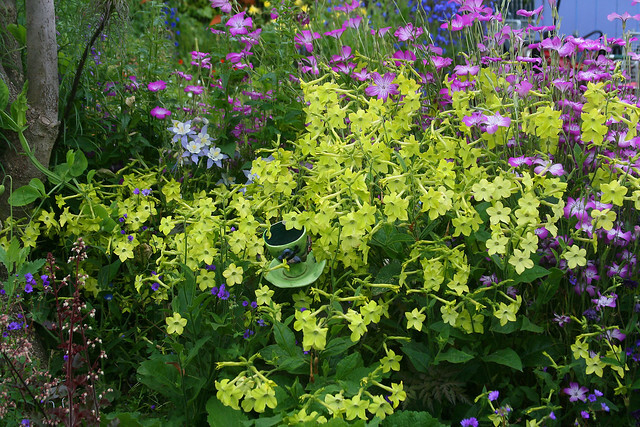 Naughty and nice planted with frothy white “Venus’ Navelwort” for maximum rock and roll! Walking around with its head in the clouds, every day is Valentine’s Day for ‘Falling in Love’. 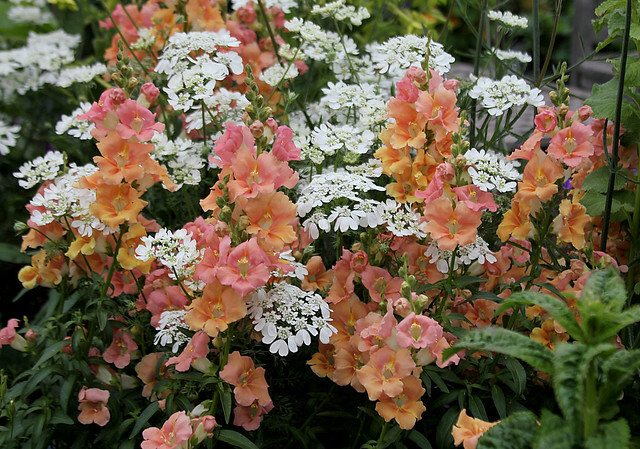 Soft and bubbly, it loves surprises and rewards admirers with a loveable mix of bicolored pink and white, scarlet-orange, rose, pink or peach blooms. Sure, some of its less showy and more bitter garden rivals call it “Flailing in Love” but it doesn’t care. It knows life is too short to give your heart to just one suitor. Do you like to wear capes? Do you keep your family jewels in a tower? 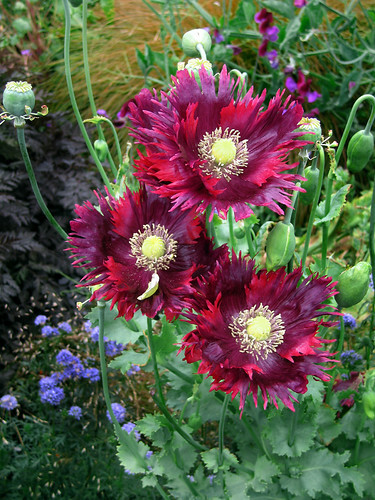 Then most certainly ‘Queen’s Poppy’ is for you! Positively regal – and immense! 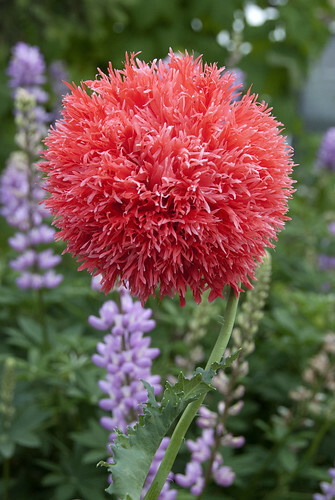 – 5″ cherry pink blooms, conferred with a white Maltese cross at the base rise up and rule the garden in late Spring. Reseeds reliably so that successive generations can ascend the throne. 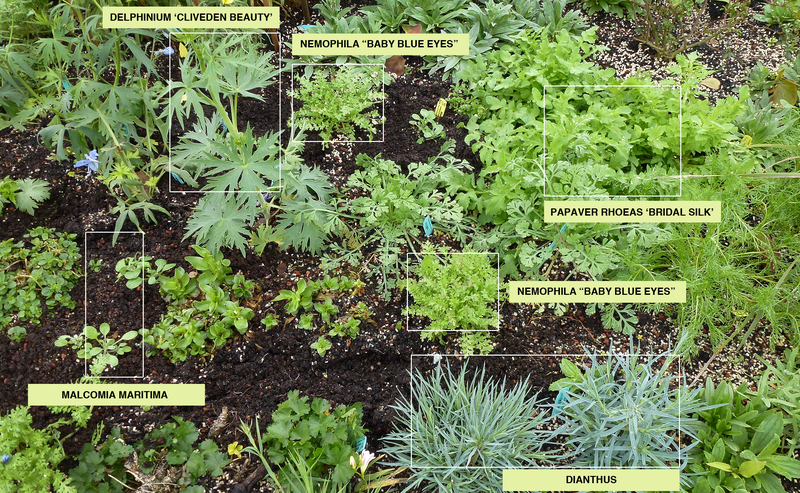 Check out all of the different varieties we grow! 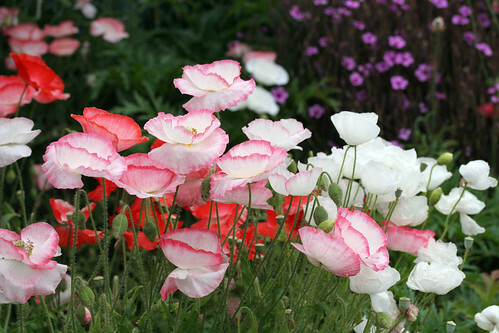 Watch a SLIDESHOW of all our favorite Poppies! So, here’s the update on how my Spring blooming combos worked out this year. 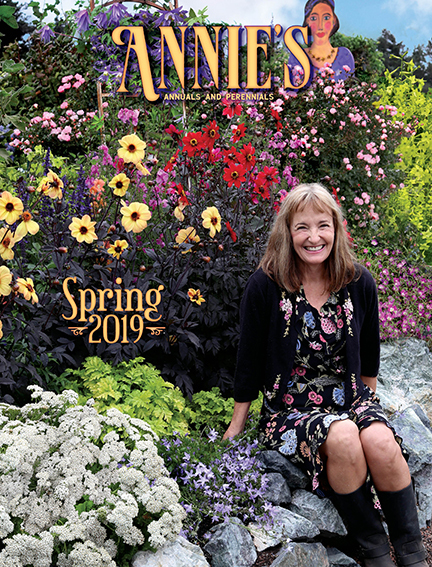 A lovely year all in all with a nice early bloom show for our Spring Party in mid-April and a perfect peak show just in time for our Mother’s Day Party. 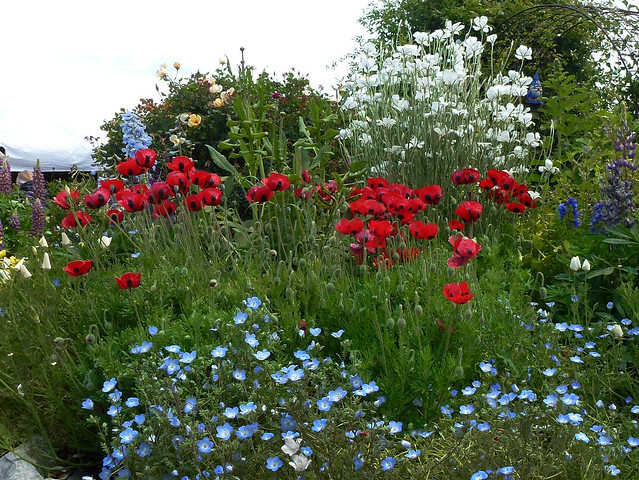 Here is the final result for the always popular mixed planting of Papaver commutatum “ Ladybird Poppy” with California native Nemophila menziesii “Baby Blue Eyes” and tall, white, cottagey classic annual Agrostemma githago ‘Ocean Pearls’ or “White Corncockle”. 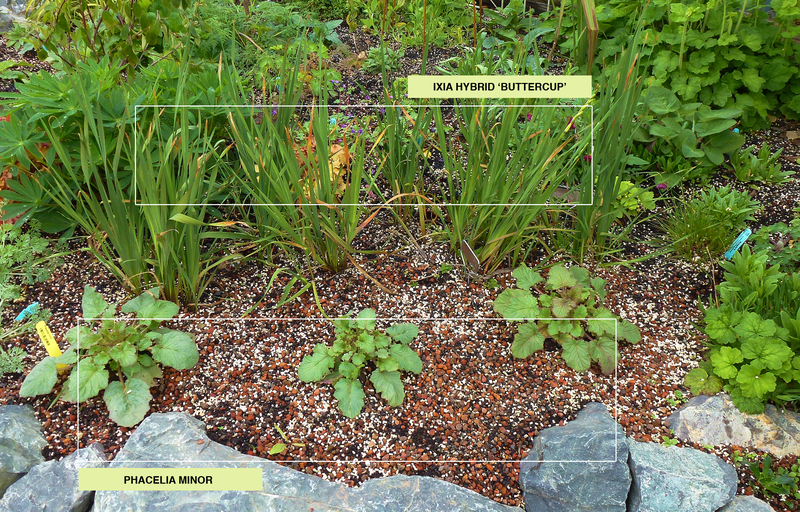 A fool proof-slam dunk Springtime combination – just imagine these plants repeated in groups over a larger space! Here it is a month earlier before the Agrostemma started blooming and when the white California poppies, Eschscholzia californica ‘Alba’, were just coming into flower. 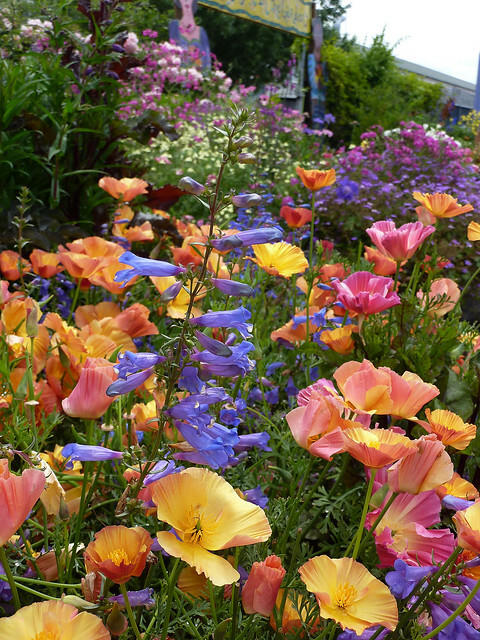 Here along the coast in the Bay Area, I plant all these annuals in early February for a maximum bloom-at-the-same-time April – May show. 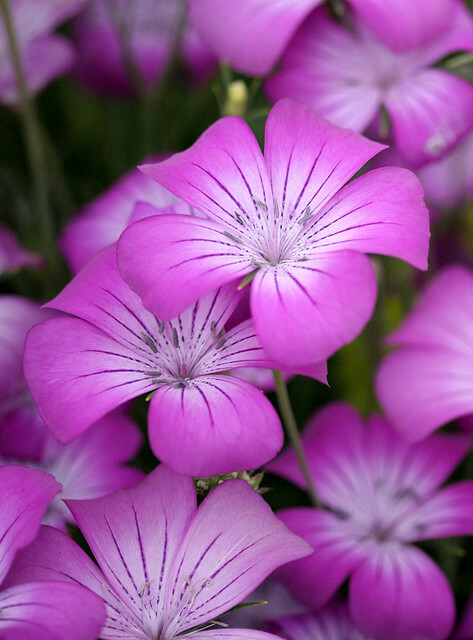 You folks in Southern California would generally plant them in November – December for a late February – March bloom. Basically, they take 2 months from their 4” pot size to burst into all their glory. 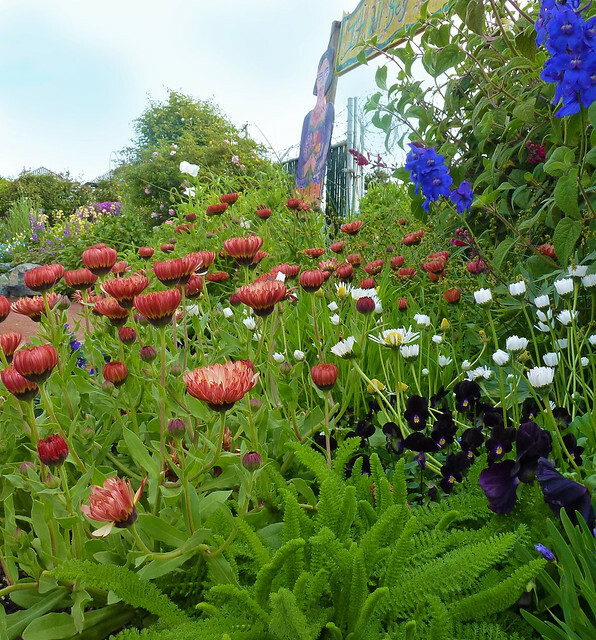 I plant them pretty darn close together – about 10-12” apart as you can see in my last blog, where I tried to show what they look like just after planting. 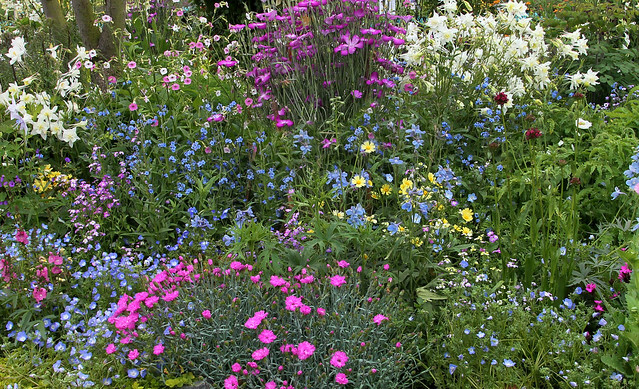 This helps them fill in fast, look super co-mingly and prevents unattractive bare space (and weeds!). Big thrill for me! My first-time experiment pairing EASY South African bulb Ixia ‘Buttercup’ and new-to-me Southern California purple California native Phacelia minor was a success! They did bloom at the same time! I planted the Phacelia in early March and it worked out just right. Wonderfully rich colored bells were displayed so showily atop quite handsome low foliage. A swell contrast with the Ixia, which has been in the ground for 2 years. 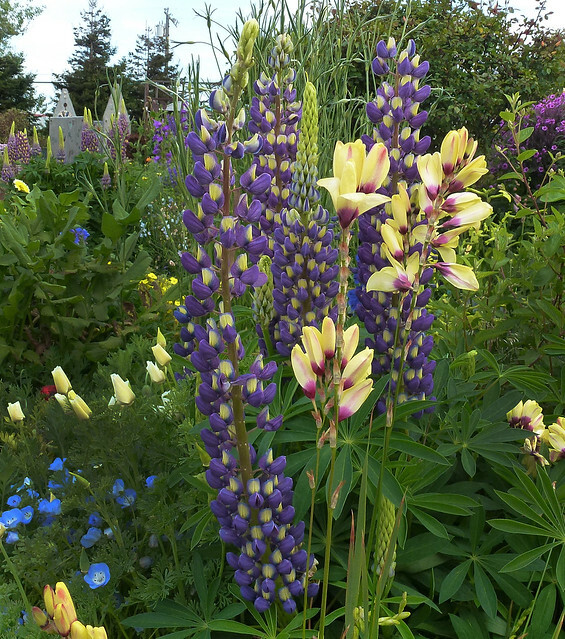 And notice the rather perfect purple and yellow bicolored Lupinus regalis ‘Thomas Church’ in the background, making a picture perfect harmonious vertical accent. 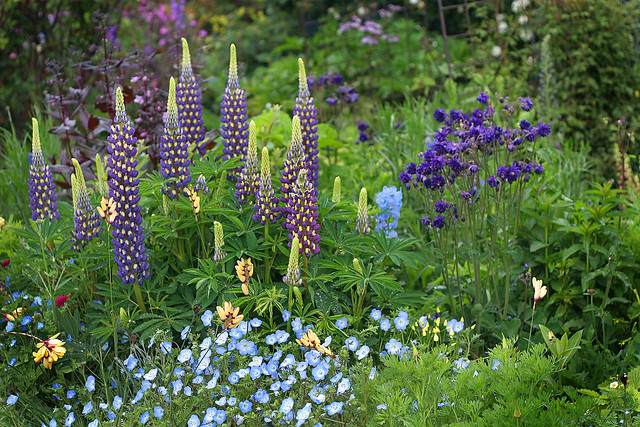 The Lupine is a perennial and so is the Ixia, which spreads politely in your garden to make a patch of bright primrose prettiness each year. 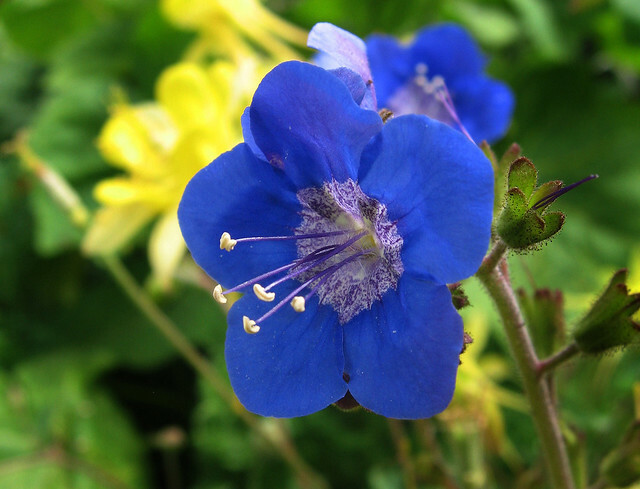 The Phacelia is a bee-magnet extraordinaire and will self-sow for a repeat performance each Spring. 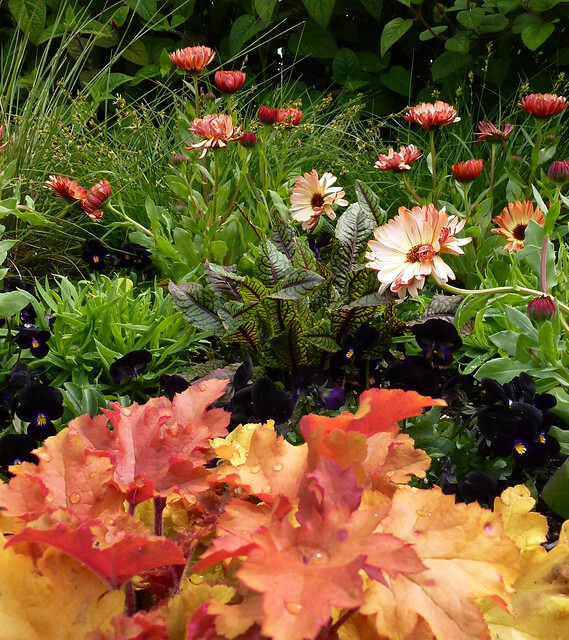 As I mentioned in my March post, I try to make the front bed as you enter the nursery as romantic as I can. Not everything worked out as I had imagined it (a really common occurrence!). This spot is under partial shadow of a tree and I always forget that sun loving plants take longer to bloom with less sun, so my white poppies, Papaver ‘Bridal Silk’, bloomed late and you can only see one bloom on the right side of this photo. Luckily, the white columbine, Aquilegia caerulea ‘Krystal’ took its place. Still pretty, though, don’t you think? 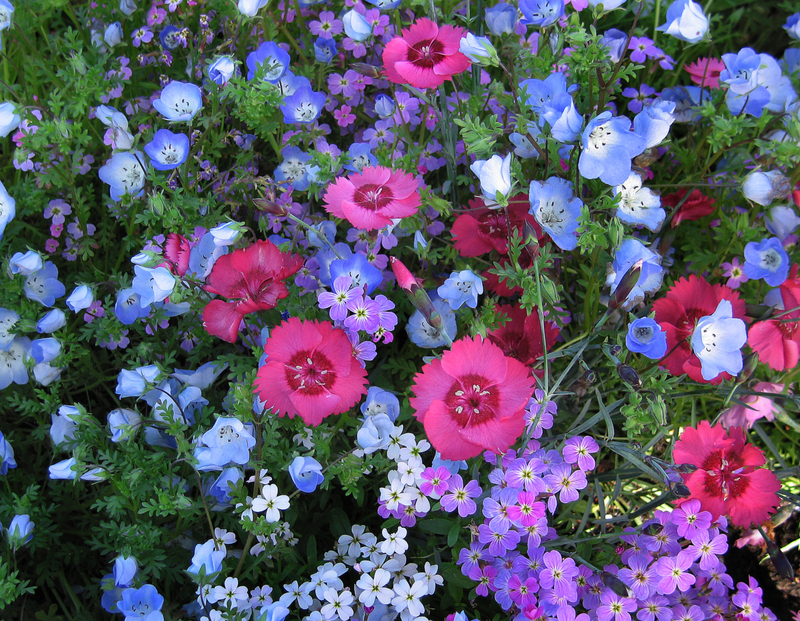 Here is a close-up of always beautiful, long lived and long blooming Dianthus ‘Pinkerton’ and “Baby Blue Eyes”. 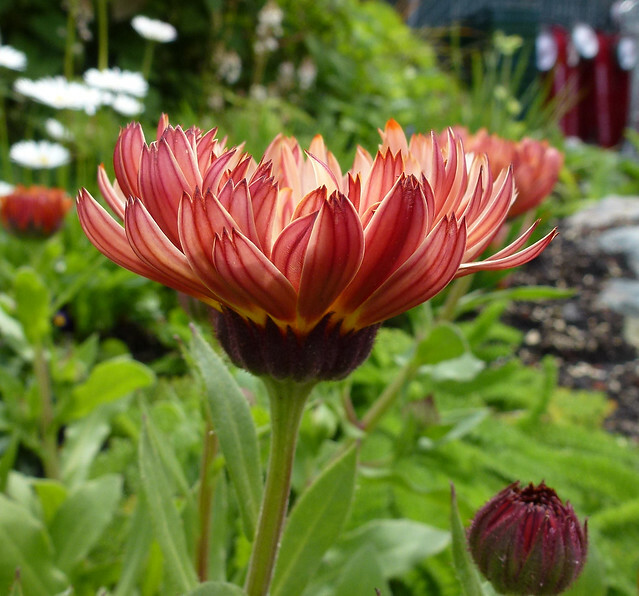 Lastly, this was the first year I’ve tried this lovely new apricot colored Calendula ‘Bronzed Beauty’ in our gardens. The gentian Ajuga genevensis I had planned for the front of the bed bloomed late this year, so I added in some quick flowering Viola ‘Bolwes Black’ along with the blue Delphinium bellamosum, peach foliaged Heuchera ‘Marmalade’ and Bellis perennis “English Daisy”. And here’s how it turned out for these photos – I think pretty nice! That’s one thing I have learned from my years of gardening. 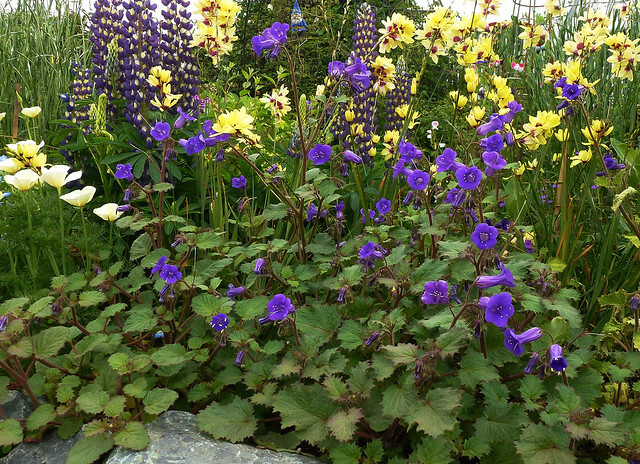 You can never quite count on perennials, like the Ajuga, to behave the same way each year or to bloom at the exact same time – that’s one important reason to accessorize and fill in with annuals. You pretty much know what you’re gonna get and that it’s gonna look great. Besides, they self-sow for free plants every new season. I hope my experiments lend some inspiration. Do stay tuned, as we filmed some nice videos of our Spring gardens this year, featuring more of my favorite “bloom-at-the-same-time combos” in all their fabulous glory! 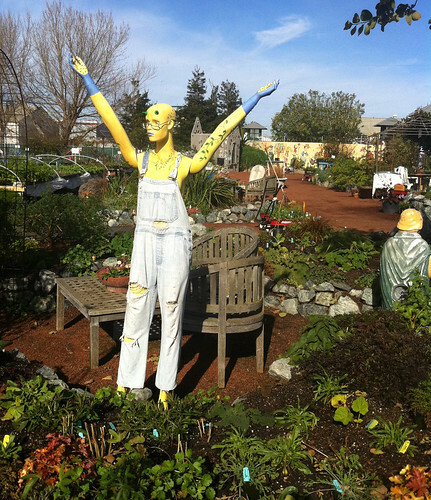 And hey, Happy Gardening everybody! People are always asking me when they come in the nursery what I’m doing in the garden right now. 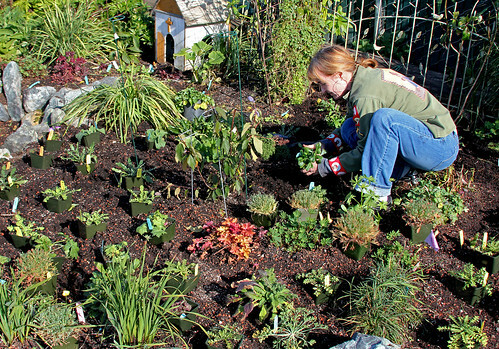 They want just a few simple new plant combinations that they can try at home. 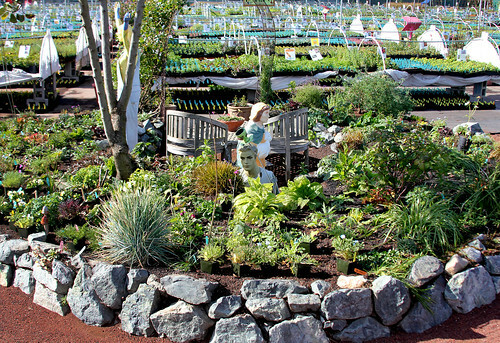 Here at the nursery, the goal for me is to get everything to be in full bloom for our SPRING PARTY on April 14 & 15. Each year, I try to do something new so that when people come in, it’s fresh and exciting. It’s thrilling and creative for me and folks are always happy and inspired to see something new. Plus, it’s fun! 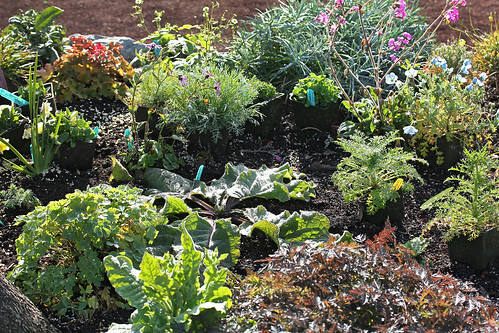 This is the first demonstration bed you see when you enter the nursery. I want it to feel romantic, Springy and welcoming as visitors walk through the front gates. 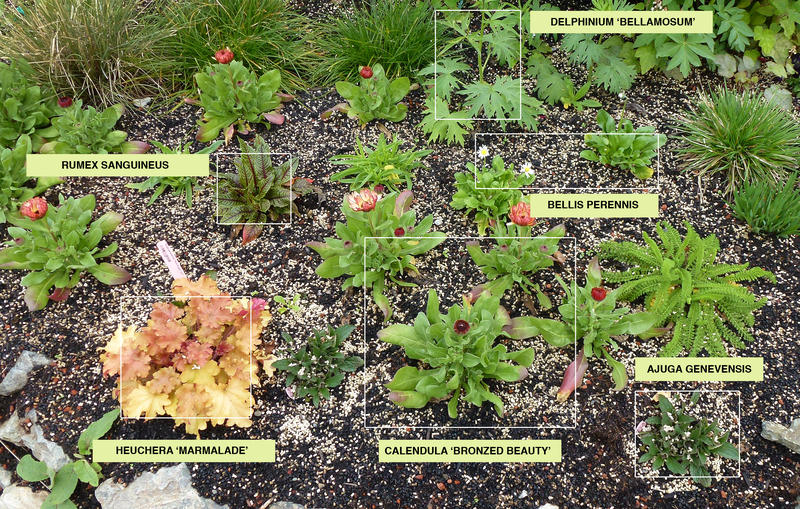 Filling in the space around established Cephalaria gigantea, “Giant Scabious” – which won’t bloom until Summer – are exuberant Spring favorites Nemophila menziesii “Baby Blue Eyes”, Papaver commutatum ‘Ladybird’ and Agrostemma githago ‘Ocean Pearls’. FYI: the white speckles covering the soil is Sluggo, my favorite non-toxic snail bait. NOTICE THE AMOUNT of Sluggo I’m using here. It’s been raining for the last three weeks straight – and that means its super snacky time for resident slugs and snails. I’ll re-apply it every five days while it’s raining to make sure my baby plants are safe. 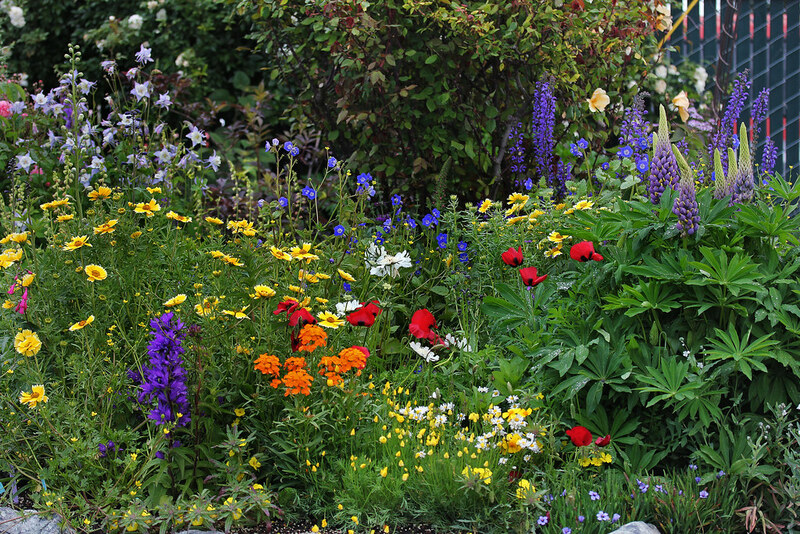 Click to see a larger view of this garden! Here’s an example of this combo with Orlaya grandiflora stepping in for Agrostemma ‘Ocean Pearls’. Pretty! 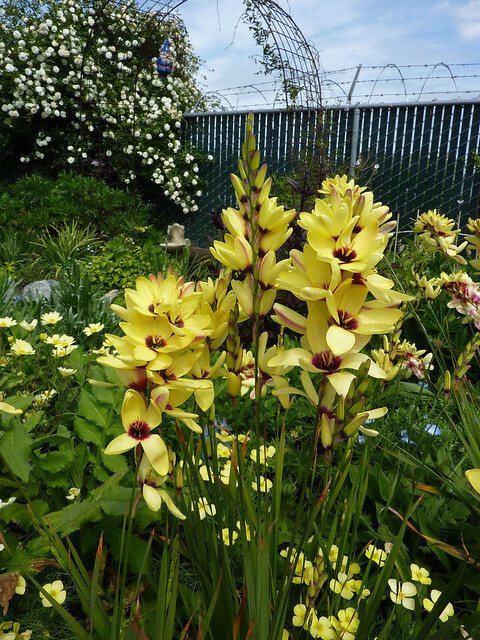 Super popular in the garden last year was Ixia ‘Buttercup‘. 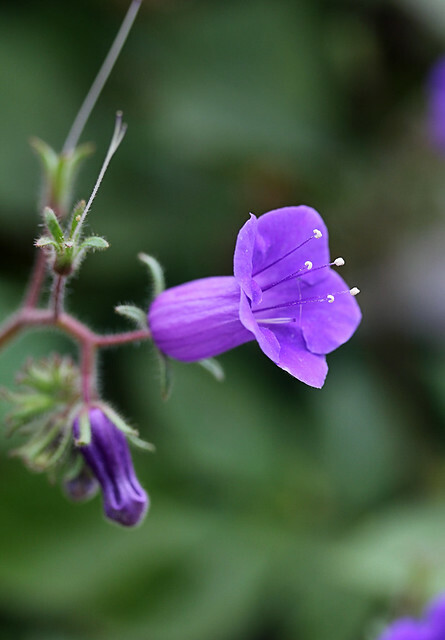 This year I’m trying it with purple flowered California native Phacelia minor in hopes that the pairing of bright purple and yellow will look exciting together. Will they bloom at the same time? Let’s see what happens! (In case you’re wondering about the orange stuff on the soil surface, I’ve added a light layer of lava rock. Because we top-dress with compost several times during the year, we add the lava rock once a year to maintain optimum drainage). 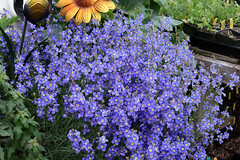 It’s a month before the Spring Party and here I am adding in the quickest to grow and bloom annual – Malcolmia maritima. I looove Malcolmia with “Baby Blue Eyes” and just about any Dianthus. 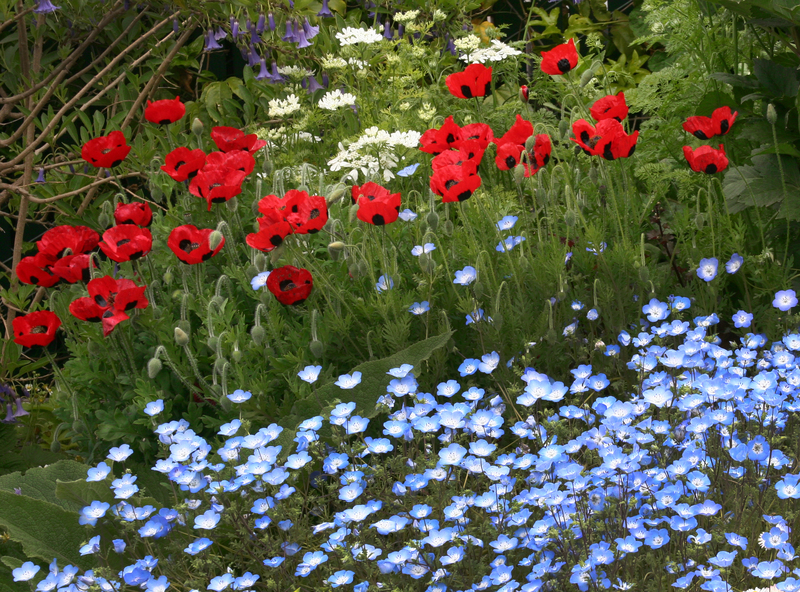 Last month, I planted the Delphinium and Papaver. The Dianthus are from last year – they remain my favorite long-lived, long blooming, old-fashioned, fragrant, perennial stand-bys for the edge of the garden. Here’s a peek at at how sweet and wonderfully SPRINGY this combo looks. 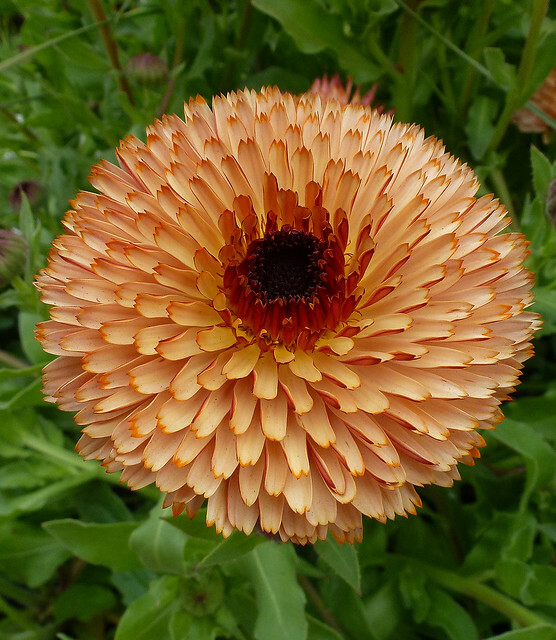 Last year I was enamored with this new two-toned peachy-ruby Calendula, ‘Bronzed Beauty.’ So this year, I planted it near the entryway. 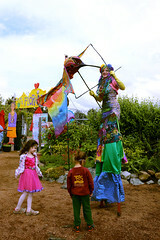 Photo courtesy the lovely Floradora Gardens. Here, I’m just adding bright gentian blue Ajuga genevensis in the foreground and Delphinium ‘Bellamosum’ in the back. Bouncy white English daisies (Bellis perennis) will fill in any emtpy spaces. For foliar interest, there are a few grasses plus harmoniously peachy Heuchera ‘Marmalade’ and ruby-ribbed Rumex sanguineus. So there you go! 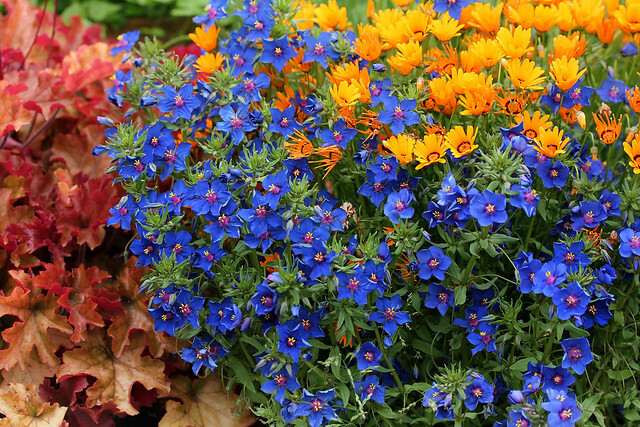 With just a few well-chosen Spring bloomers, you can make great combinations that will delight your eye and make you and your garden feel so totally successful! 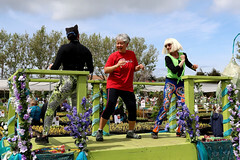 Looks like the gardens will peak just in time for our Mother’s Day Party on May 7 & 8! Get all the deets HERE! Everything is blooming about a month late because of the cold and the rain and the hail (and the rain an the hail and the cold). We didn’t know if this year’s gardens would end up a complete disaster after an unusually brutal Winter but once again, Mother Nature is delighting us with her magic. 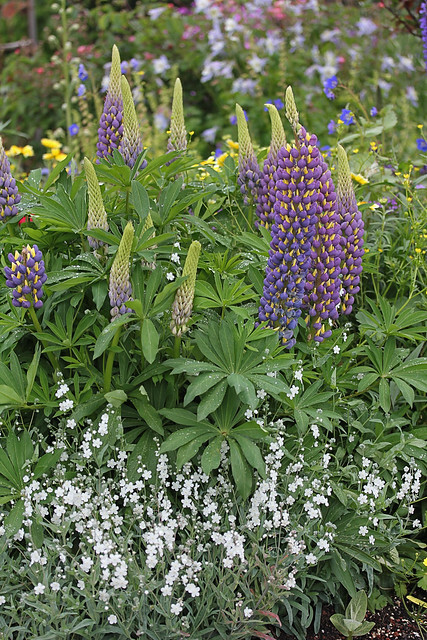 Lupinus 'Thomas Church' and Aquilegia v. 'Blue Barlow' looking spiffy! 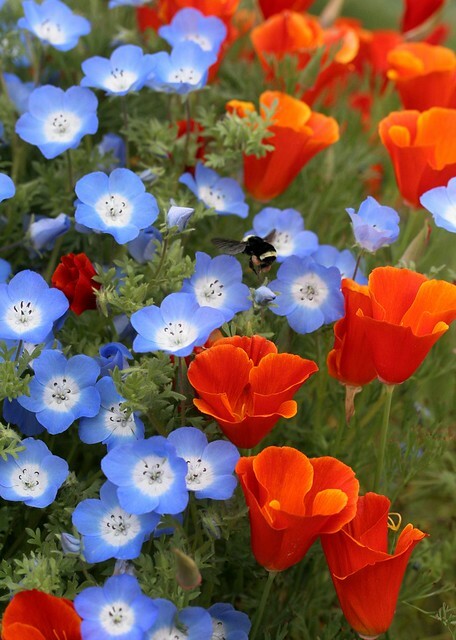 The California natives seem to be especially slow, with California poppies yet to bloom and Nemophila menziesii “Baby Blue Eyes” growing in slow motion. But, the Lupines are earlier than ever and thriving! Layias were one of the CA natives not affected by the rain and it didn’t seem to mind the cold. Some of them did get a little beaten down by the hail, but they’re sure bringing their rays of sunshine to the beds right now. Layia platyglossa "Tidy Tips" and Penstemon pseudospectabilis with Campanula glomerata. 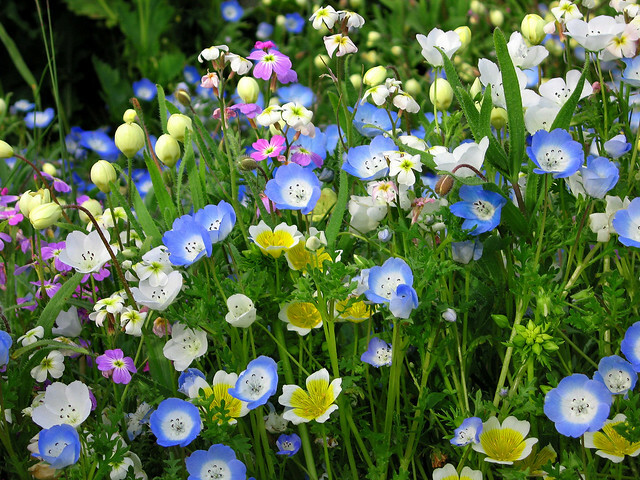 Layia glandulosa makes the perfect partner to Nemophila menziesii "Baby Blue Eyes." We’re LOVING the true form of Layia glandulosa. 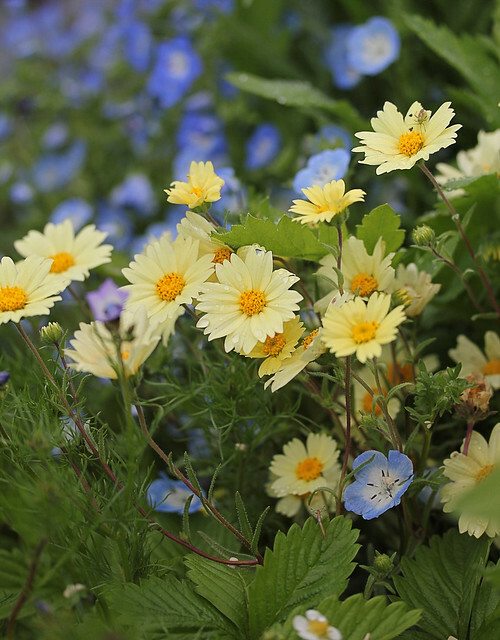 Everybody loves blues and whites in the Spring garden, but you need soft yellows to balance it out and bright pinks to make it pop. I’m so excited because this is the perfect soft yellow to go with all of our Spring bloomers! 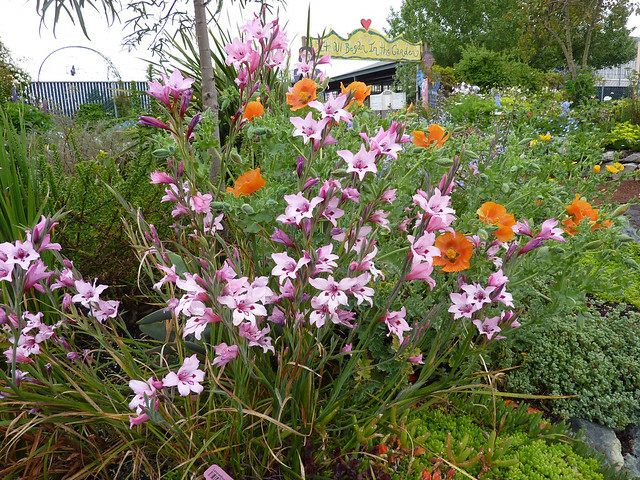 Gladiolus carneus "Painted Lady" and Glaucium grandiflorum make odd bedfellows. Every year is different and full of surprises. I’ve never seen these two plants bloom at the same time before, hence the unusual color combo! That’s Gladiolus carneus, a South African bulb, returning for another year and Glaucium grandiflorum (orange), blooming much earlier than it usually does for us. Both require no Summer water. Just coming into bloom is Delphinium belladonna ‘Cliveden Beauty’, Sidalcea hendersonii and ultra-blue CA native Phacelia viscida. 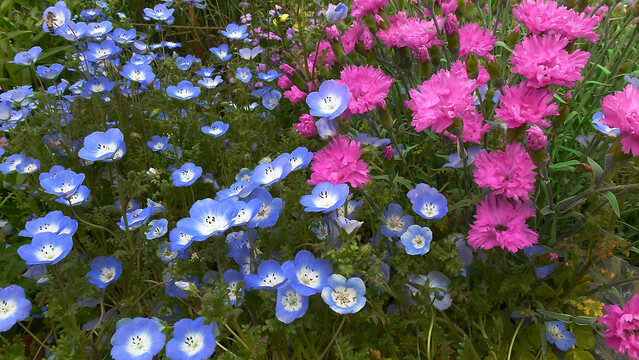 The Sidalcea is one of my favorite perennials, I use it everywhere because it blooms Spring thru Fall and is so very reliable, becoming bigger and bloomier every year. 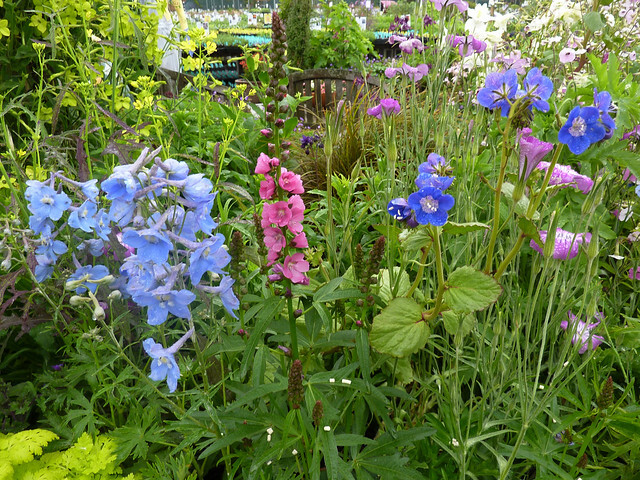 From left to right: Delphinium belladonna 'Cliveden Beauty,' Sidalcea hendersonii and Phacelia viscida. Bumblebee magnet Phacelia viscida how we love you! 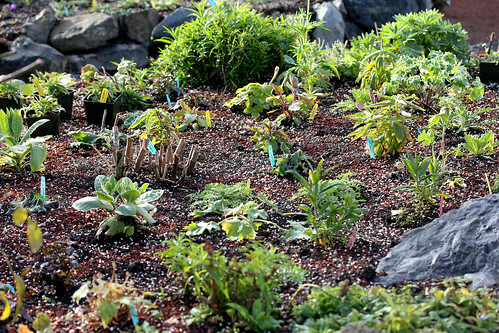 Believe it or not, there are a whole lot more plants still to bloom in this garden. I think they should hit their peak just in time for our Mother’s Day Party on May 7 and 8. How cool is that? You should definitely come – bring your Mom AND your camera! MORE ABOUT THE PARTY HERE! 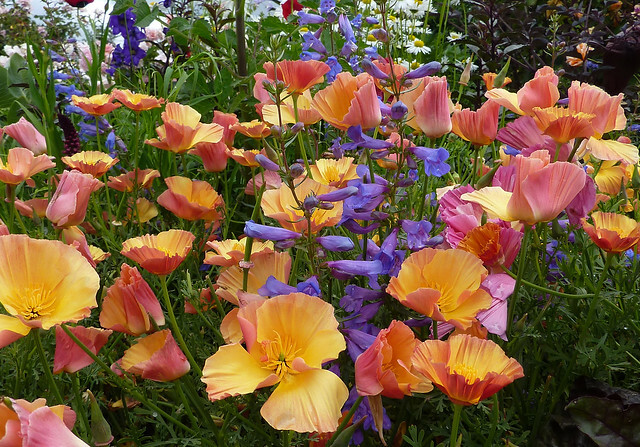 Carnival colors: Greek poppies (red), Layia platyglossa (yellow), Cheiranthus allionii (orange), Eschscholzia caespitosa (shortie yellow) and Aquilegia c. "Rocky Mountain Columbine" (light blue in background). 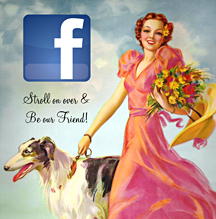 The sun is shining and the birds are singing! Even though much of the country is still blanketed under snow and ice (brrrrr! 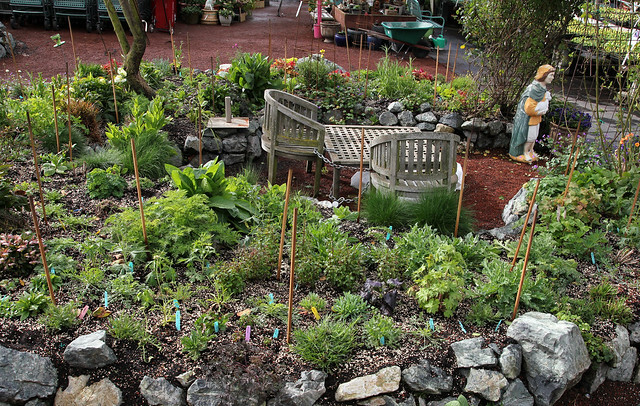 ), we’re pretty lucky here in USDA zone 10 to be able to garden year-round (not that we’re gloating or anything). 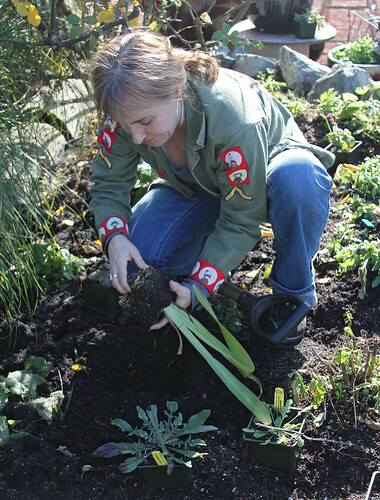 Each year, Annie completely replants our demonstration gardens to keep things fresh and exciting. 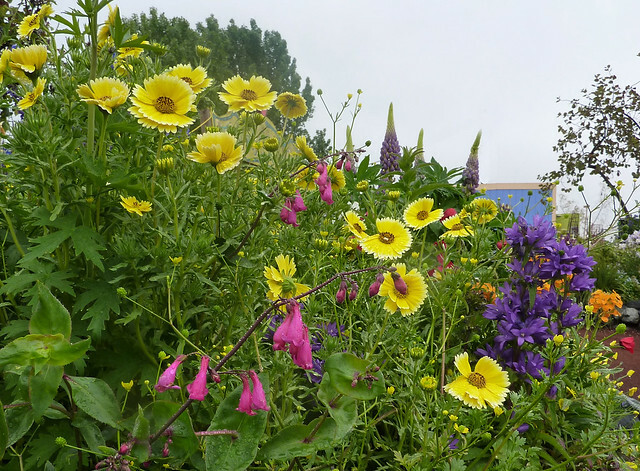 It’s dramatic to see everything ripped out and a new garden taking shape from scratch, but new designs and combinations provide inspiration for both us and our visitors! 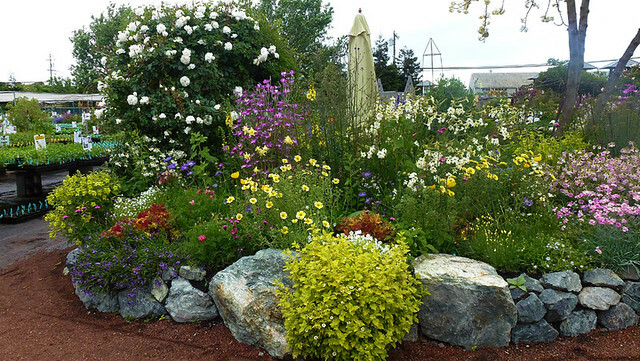 Back in November, she turned over the soil, took out the spent annuals and cut the perennials down to the ground. She ditched the ugly plants, the unruly plants and anything that didn’t fit with the new planting scheme taking shape in her head. This made room for lots of new babies. The goal – and challenge! 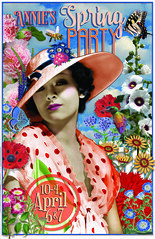 – is to have everything bloom at the same time for our Big, FAB Spring Party on April 9 and 10. 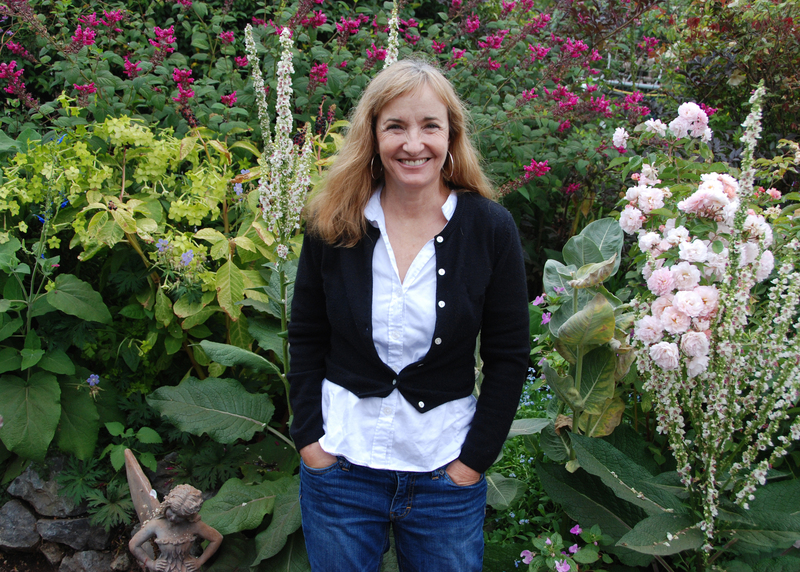 November is also when she planted biennials like Digitalis and some varieties of Verbascums and Campanulas, along with perennials like Alonsoa meridionalis, Delphiniums and Nicotiana alata ‘Lime Green.’ Of course, all of these plants can go in the ground right now for May or June bloom! 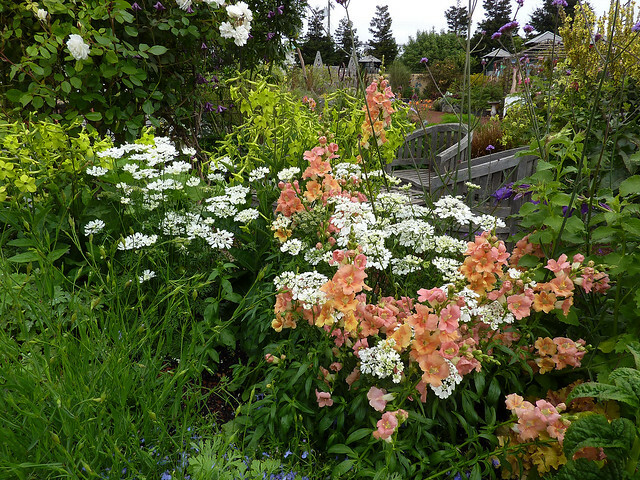 Right now, if you were to drop into the nursery, you would find her still planting a few perennials, as well as slower growing annuals like Orlaya grandiflora, Agrostemma githago, Omphalodes linifolia and Cynoglossum amabile. 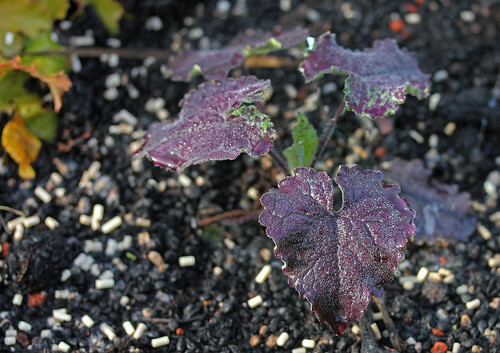 It’s also a good time to put in foliage plants like Heucheras, Rumex and grasses. We planted a few Sweet Peas in November and will plant some again soon, so we’ll have a succession of frilly, fragrant blooms from April to June – longer with deadheading! 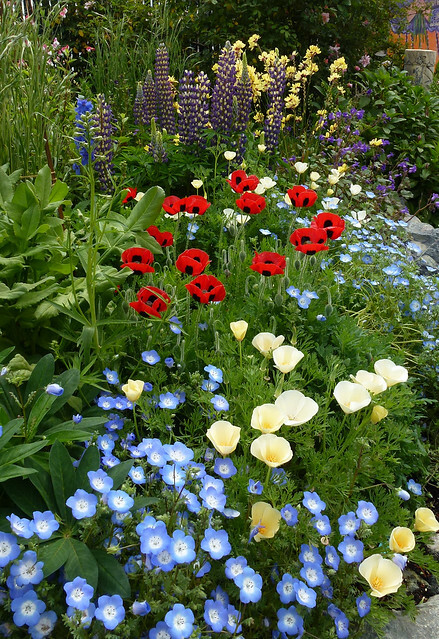 Very soon, the faster blooming annuals like Poppies and California native “Baby Blue Eyes” and Eschscholzias (Cal Poppies) will go in the ground – but remember – we’re shooting for early April bloom. So you can definitely plant them right now or anytime really until the end of March or beginning or April for later bloom. Don’t forget to protect your little babies from slugs and snails! We use Sluggo, a non-toxic iron-phosphate based bait that is safe for pets and kids. Snails are ravenous and they’ll chow down on those delicious little CA natives until they are but stubs in the ground. 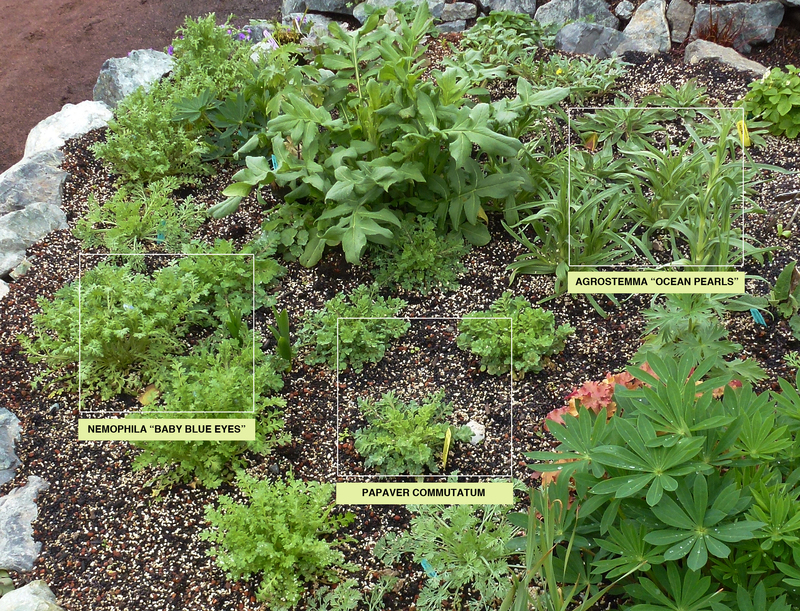 You won’t be very happy if that happens – and neither will the plants. Even though the goal is to have everything bloom-at-the-same-time, sometimes the weather doesn’t get the memo. 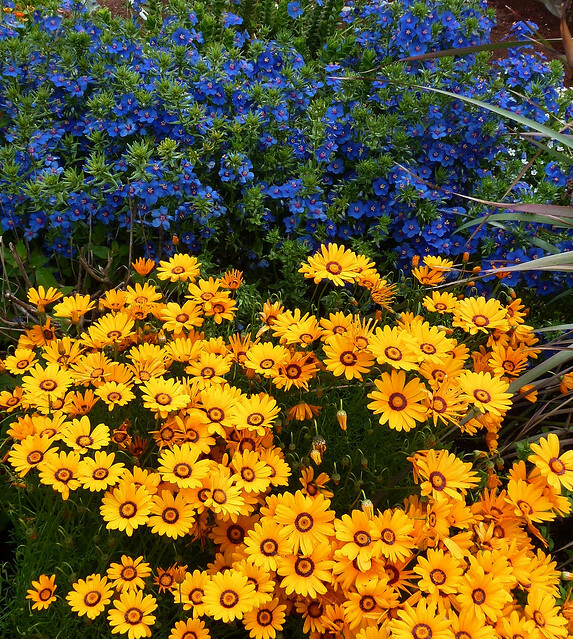 A cold and rainy Winter will slow everything down, while sunny weather in December and January can result in a massive bloom-a-thon in March. So we aim for the middle and hope for the best. And it usually works out pretty well!